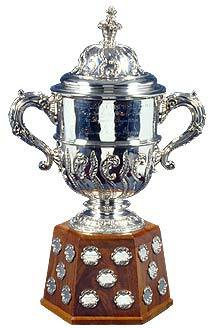 This trophy was presented by the member clubs in 1968 for perpetual competition by the NHL in recognition of the services of Clarence S. Campbell, President of the NHL from 1946 to 1977. From 1968 through 1974, the trophy was presented to the regular season champions of the West Division. Beginning in 1975, it was awarded to the regular-season champion of the conference bearing the name of the trophy. From 1982 to 1993, the trophy was given to the playoff champion in the Campbell Conference. And since 1994, the trophy has been presented to the playoff champion in the Western Conference. The trophy itself is a hallmark piece made of sterling silver and was crafted by a British Silversmith in 1878. Leading winners: Edmonton Oilers, Philadelphia Flyers (6), Detroit Red Wings (5), Chicago Blackhawks (6). The 1967-68 Philadelphia Flyers were the first receipients of the Clarence S. Campbell Bowl.